It’s only halfway through the day and already good things have happened that are worthy of recording. I made quiche (affectionately known as Kitchen Sink Quiche, because apart from the two eggs and the milk, I toss whatever is in the fridge into it; today it was grated zucchini from the school’s garden, aged cheddar, diced ham, red pepper, and broccoli, all in a homemade crust) It was absolutely delicious. We brought the delicious quiche over to Kristie’s house and fed it to her. We got to watch Owlet and Rowan play together, which was thoroughly enjoyable, partly because they played so very well with one another and partly because it was my daughter playing with Rob’s son. That’s special indeed. Our garden has been producing lovely peas and cherry tomatoes, upon which we have all been snacking, and the Beefsteak and whatever the other kind of full-size tomatoes we planted is are nearly ripe. And my basil, chives, and parsley (which all got chopped and tossed into the quiche) are bushy and healthy. HRH installed the shelving we had stored away in the front hall closet and the attic office cupboard, and we sorted through and organized shoes (which all have their own shelves now instead of being in a pile on the floor, thank the gods) and all my yarn and fibre (ditto, hurrah!). I found the missing bag of organic Merino I got for dyeing, and a couple of other bags of fibre I’d forgotten I had, including a braid of lovely Ozark silk sliver in pale greens, pinks, and cream. It looks like watercolours. I sorted through the other set of baby clothes for 2-4 year olds and found the missing denim ball cap Sparky wore when he was a baby, as well as more soft shoes and lots of socks. We finished watching Sora no Woto with Marc M, and it may just be my favourite anime series we’ve watched together so far. It was beautifully told and illustrated, and had lovely music. This entry was posted in Art, Theatre, & Film, Blessings, Diary, Food, Knitting, Spinning, & Weaving, The Girl, Words Words Words on July 31, 2012 by Autumn. I am now in that limbo between forty and the answer to everything. It was a quiet birthday. We’re all rubbing against one another uncomfortably here at home; no one is used to having all four family members home all the time for more than three days in a row, and we don’t know what to do with ourselves. The day started off very nicely, and then we kind of got irritated with one another, but it ended nicely again. We had sushi as a birthday treat, and Owlet devoured a kappa maki and Sparky decided that he liked sake sashimi (which he has liked on again and off again since he was three… mostly off again). Now I am excited, because this means we can go out for sushi together and everyone can eat something. The birthday may have been quiet in person, but online there was a riot of birthday wishes and greetings in forums and through Twitter and Facebook and via e-mail. It took me ages to read through them all, in several sittings. Thank you again, everyone! My birthday is also my parents’ wedding anniversary. My rudimentary math skills tell me that as I was born on their fourth wedding anniversary, they have now been married for forty-five years. I had an early birthday dinner with my in-laws before they left for a month on holiday in Cape Breton, which was lovely. They gave me a teacup and saucer that had been owned by HRH’s maternal grandmother, and I had my tea in it the very next morning. I love gifts like that, that come with meaning and history. They also donated to my Saving Up for an iPad 2 fund. My parents sent me money for the same fund (and blew me away with their generosity! ), and HRH and the kids also gave me a gift certificate toward it. I am over halfway there already. I want to get it before I leave for my conference on the first weekend of August, because then I will be able to Skype with the kids each night. The Windows laptop that could handle Skypeing is now dead, the old iBook that is a glorified typewriter can’t run the program or load the web-based interface, and my iPhone doesn’t have a front camera. The iPad is the result of a long research- gathering and decision-making process. It was evident that I needed an alternate work computer. I use my iPhone all the time via wi-fi through the day, and I also wanted a larger e-reader where I wouldn’t be turning a page every five seconds. I liked and coveted the iPad, which answered most of my needs, but I couldn’t justify it since I couldn’t use it for editing, which is the majority of my work. Track Changes is my main tool, and iPad apps didn’t handle it. If I needed a backup unit to work with while travelling or if my desktop went down again (please no, not any time soon, or ever again, really), then investing in a computer-like thing that couldn’t be used for work was pointless. So I kept looking at small laptops half-heartedly, which would let me work but not provide an easy e-reading experience or the casual online messing about and communicating I enjoy doing. It was starting to look like I’d have to buy two separate units, and if I was being responsible (and that was essential, because money has been really, really bad) it would have to be the laptop first. And frankly, that made me cranky, because I wanted the fun thing first, after a couple of years of making do in pretty much every area of life. At least… the iPad apps couldn’t handle Track Changes editing until a couple of months ago, when app developers began to provide the Track Changes function in response to the demands of users. And when I discovered that, my dilemma was solved, and the iPad was a go! I decided that I’d ask for money and gift certificates for my birthday, and when my paycheque from my first freelance job after a year off came in, I’d make up whatever was left and buy one. I’ve got the Bluetooth mini Apple keyboard that came with my first Mac mini to pair with it, so I’m not limited by the touch keyboard if I do work on it. Now my last decision is whether to go for the black one, to minimize the grunge-collection, or go with the white, which will blend in with the documents and books I’ll be reading and working with. And what kind of case I’ll get for it, of course. We enjoyed a lovely dinner with Eric yesterday at his new house. All aspects of the visit were lovely, and future visits will be even lovelier when Soo and Ro move up to join him next week. The evening ended with cheesecake, of which I am not a fan, but this one changed my mind. Not only that, he sent me home with the remaining 3/4 of the cake. I don’t know if this is a universal un-disliking of the cheesecake genre, or just of this one particular kind from this specific bakery, but I’ll take it! I have disliked cheesecake mostly for its (a) leaden texture and (b) the heavy taste of cream cheese, a food I don’t like. This one was feathery light, tasted of butter and cream, and was more like a mousse with only the faintest nuance of cheese. A fabulous thick graham crust, a light cheese layer that had the texture of a heavenly vanilla sponge cake, and heavy whipped cream on top of the cheese layer with a pile of seasonal fruit and sliced almonds along the sides… really, it was divine. And the sausages he grilled for supper (particularly the broccoli-cheese ones) along with the watermelon-feta salad… I think I ate from the moment we got there till the moment we left, either grazing while we prepped food or formally partaking of supper. And that includes eating the tiny apples off the trees in his backyard, with fruit so sweet and somehow fizzy that they tasted like apple candy. And finally… seven years ago yesterday, Sparky came home from the hospital to properly start life with us as a family. The middle of July is full of celebration in my family, and I am thankful for all of it. This entry was posted in Blessings, Cyberspace & Technology, Diary, Food, Weather, Seasons, & Celebrations, Words Words Words on July 14, 2012 by Autumn. This is the day where I let my brain turn to mush, after gunning for a deadline. One day off. I dropped the boy off at school and did half my errands. These are things that have piled up over the past two weeks because what energy I had went to working and thinking. I went to the thrift shop and bought a pair of jeans and a new cotton jersey top that fit and look terrific. I picked up some white lithium grease for the new wheel, because the metal treadle bar is squeaking where it moves in the wooden sockets. (Coincidentally this should make the track for the sliding back door a bit quieter and perhaps less rough to move; it won’t solve the issue completely because most of it comes from a chewed-up track that was like that when we moved in.) I have to stop by the library and the grocery store on the way to get the boy after school, too. Yes, the school bus strike is still on, not being the potential one-day-only thing it was coyly suggested it could be. The boy is aggrieved; riding the bus is one of the best things about school. It is HRH’s birthday today, and so I am making a Special Dessert. I may make a Special Dinner too, or as special as it can be with a five-year-old who has to eat what we eat. It is Wednesday and orchestra night, and for ease of prep Wednesday night is usually Breakfast for Dinner night; I don’t know what changing that up will do to our dinner equilibrium. I can’t quite bring myself to serve HRH eggs, sausage and toast on his birthday, though, especially since he usually makes it. Even if he enjoys it. I tested the new wheel last night, and very quickly fell in love with double drive. I found a 6-gram handful of Falkland fibre to test it with, perhaps not the best thing because the only other time I have tried it was to test a Hitchhiker wheel at Ariadne Knits, my LYS, so I’m not that familiar with it. (That did not go well, if you are wondering. The Hitchhiker has some innate design/physics flaws that I’m sure I’d find workarounds for if it were my only wheel, but as it isn’t, I played with it for an hour and concluded that it was pretty and cute but not practical to use.) I remember the Falkland being sort of like Corriedale, but with a sproing to it that now reminds me of Polworth since I’ve spun that since then. The Symphony handled it beautifully. 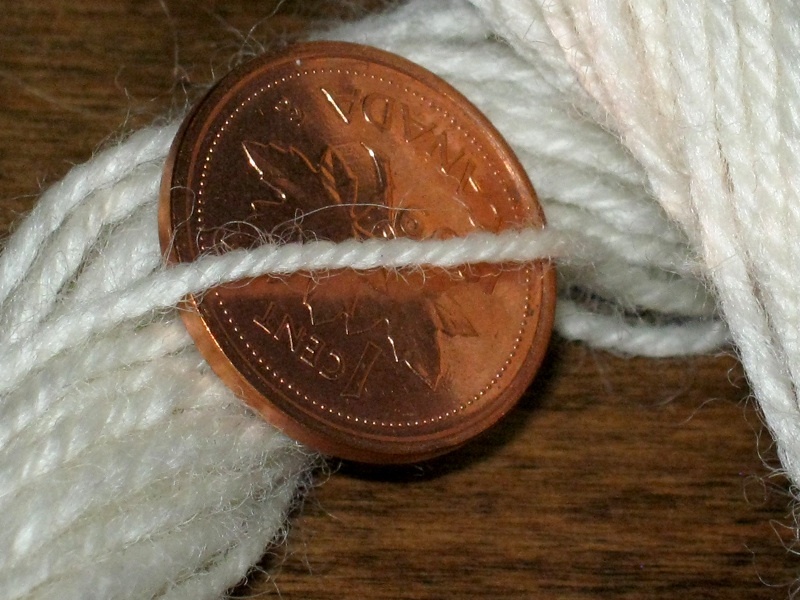 I first had the tension and takeup set too tight, so when I broke my single I couldn’t pull the spun stuff off the bobbin without it drifting apart. I moved the mother of all closer to the drive wheel and magically the single took more twist, and I spun a fabulously thin, strong single in a short forward draw worsted style. Alden Amos gave me a rundown of how to adjust tension on a double drive to attain certain goals and talked about the difference in ratio between the bobbin pulley and the flyer pulley, and thank goodness I have his book with details and descriptions and physics lectures, because double drive is only barely mentioned in my other two spinning books that focus more on drafting and plying and such. I then transferred my bobbin of singles to the lazy kate and chain-plied it into 15 yards of a sample skein, which means I got roughly 45 feet of worsted single from 6 grams of fibre. I forgot the check the WPI of the single, but the finished yarn is about 24 WPI. I have the rapturous task of sorting through my big wicker basket of indie dyer fibre to choose what to spin first. I think I want to try something I’ve never spun before. As I said to Jodi Meadows, another writer who spins, there’s some Rambouillet from Squoosh fibre arts in a burgundy/brown colourway I think I might try, or I may finally break into the Northbound Knitting fibre I got last fall in a three-month subscription to her fibre club; perhaps the Wensleydale, or ooh, there’s some Rambouillet in a lovely blue-green colourway there, too. I had to re-tighten the leather connecting the footmen to the treadles, but apart from that and the treadle squeak, I am tremendously pleased with my initial experience with the Symphony. I discovered an oddity, though; among the two whorls included in the wheel, the smaller one seems to have a plastic bushing in it with no threads, so I can’t screw it onto the flyer shaft. It’s also got an odd cut across it. I’ll take a photo of it and post it to the forums to see if it’s supposed to be like that (can’t think why), and if it’s not I’ll contact the North American distributor and ask for a replacement. Fortunately I ordered the extra-small/fast and extra-large/slow whorls to expand the wheel’s ratio range, so I have plenty of other options in the meantime. It’s just that one of the reasons I got the wheel was to have the 16 and 20 to 1 ratios at my disposal. Today I also have to cram for orchestra tonight, as our principal will be missing which means I’m technically the section head (ha ha ha ha ha). I am mostly concerned about keeping up with the runs in the Beethoven hitting the right notes, and not losing my cool when the conductor turns around to wave his baton right at me, which is infallibly a recipe for startling me and making me lose my place. EDIT: Contacted the North American distributor about the small whorl that doesn’t fit the flyer or match the construction of the other; turns out it’s a whorl for a totally different wheel in their line. They’re shipping me a replacement. Hurrah! This entry was posted in Diary, Food, Knitting, Spinning, & Weaving, Photographs, Words Words Words on February 16, 2011 by Autumn. The boy’s fever is bouncing between 99.5 and 101 but he’s his usual cheerful and energetic self, so we’re calling that a win. He was thrilled to open his last door in the Kinder Advent calendar today; he’s been looking forward to that egg for some time. HRH went out this morning to pick up an early Christmas gift of an FM transmitter for the car, so we can listen to the iPod Touch on the go. The boy’s daycare coordinator stopped by with a gift for him this morning, too. The boy has been struggling with the knowledge that there are gifts from MLG and Ceri, Scott, and Ada for him under the tree, and has been asking at intervals if he can open them. I told him point blank this time that if he asked again the presents were going away and he wouldn’t get them at all. “I’m never going to get to open them,” he mumbled. “Not till Christmas Day,” I said. “Which, after all, is the whole point of Christmas presents.” Everything else will come out of where it’s been hidden tonight once he’s asleep; this has been done in self-defense and the preservation of sanity. I remember the interminable creep of time as the twenty-fifth approached, but he’s doing pretty well. He’s had lots of fun today: he watched cartoons till noon, then had lunch, then played out back in the piles of snow with HRH, played inside with Lego, and is now watching a movie. We’ve been tracking Santa on Twitter and through NORAD at intervals as well, which has been lots of fun. (I am never reminded of how colossally lame my world geography is as strongly as when I track Santa through Google at Christmas.) When I was a kid we used to listen to the radar tracking Santa on the radio on the way home from the Christmas Eve church service, and it was the most exciting thing ever. I kind of miss the more mysterious radio version. After dinner we’re Skyping with my parents so everyone can wish one another a happy Christmas, and there’s also the magic reindeer food to scatter all over the snow in the backyard before bedtime. The boy was discussing the idea of staying up to see Rudolph (not Santa, but Rudolph; we know who the real rock star is in this house), but eventually concluded that not only was it too risky in that if Santa figured out he was awake he might not stop by the house, and apparently Rudolph is a very shy reindeer (I was unaware of this; one learns something new every Christmas from very serious children). And in the realm of last-minute realizations, I have no sage with which to flavour my stuffing tomorrow (I shall call my mother in law and ask if she has some I could borrow; I honestly thought I had a whole container of garden-grown sage in the freezer), and my breezy assurance that they could bring the defrosted turkey over with them when they come tomorrow means I won’t have the time dry-brine it the way I usually do. I guess that means I have to try the herbed butter under the skin thing sans brining that I’ve been idly considering for a while. Time to dig out that recent issue of Fine Cooking (or just look it up online, voila). Have a wonderful evening, everyone. I usually get a few minutes to post on Christmas Day itself, but if I don’t this year I wish you an excellent day, whether you are with family, friends, colleagues, or your cats. This entry was posted in Diary, Food, The Boy, Weather, Seasons, & Celebrations, Words Words Words on December 24, 2010 by Autumn. What a glorious weekend! The sun was bright, and the temperatures were kind enough to be around 8 degrees C (which felt much warmer in the sun). It was very good for general morale. The weekend began at 5:00 on Saturday morning when the boy woke us up in a panic because he was throwing up. We suspected one doughnut too many the evening before, but reconsidered our diagnosis to be the gag reflex brought on by a coughing jag when he demonstrated the coughing-almost-to-throwing-up again a couple of hours later. The boy snuggled in bed with me, feeling very sorry for himself, while HRH got up to made himself a pot of coffee and read a bit before heading out to get in line at the garage to have the tires changed to the winter set. He was back by 9:00, to our surprise (the garage opened at 7:00 and as it’s the weekend before Quebec law requires snow tires, we anticipated long lineups), and then he just kept going! He brought all the Christmas decoration boxes in from the back shed, tested all the sets of outdoor Christmas lights, then took the boy out to buy various caulking and sealants and strings of Christmas lights to replace the dead ones. While the boy napped (rare in this day and age, usually only when he’s ill) HRH climbed up on the roof and set the hooks, then put up the lights. When the boy got up he and HRH went for a walk to see the terribly overkill but amusing Christmas decorations on the house the next street over, complete with a Santa-piloted red biplane on the roof. (People, it isn’t even halfway through November yet!) My Saturday accomplishments were finishing weaving the black scarf then sewing the knitted hood to it, and rereading most of Sailing to Sarantium. I was pretty fried by an intense work week. I finished the repurposing project; all I need to do is finish the layout coding and I’m done, so it will be handed in right on deadline tomorrow. 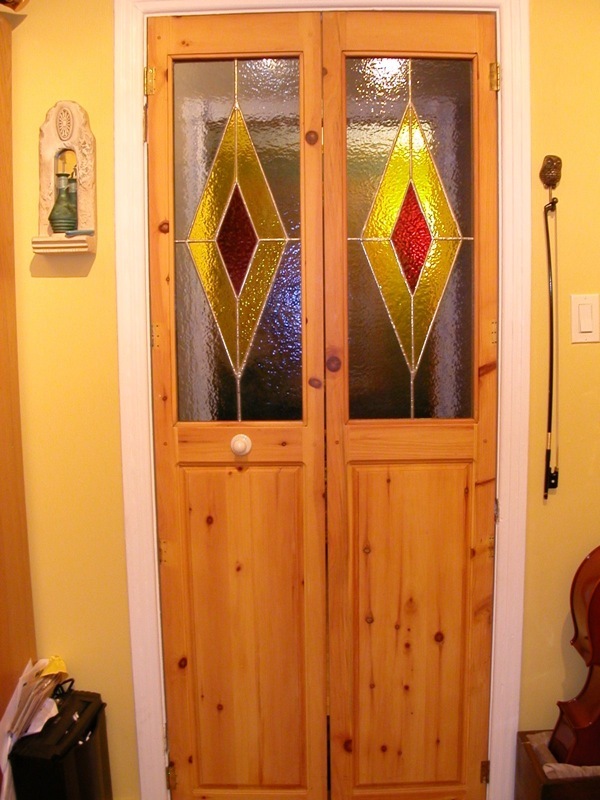 Once the doors were up, together we hung the pictures in the hallway that had been cluttering the hall table and lying underneath it since we moved in. I can’t believe the amount of work he accomplished this weekend. Then I made cookies once I’d finished my work. (Translation programs are unintentionally amusing; Google told me that “sash dance” was “danse avec guillotine,” which made me laugh for much longer than it ought to have. I understand why it translated it that way — in French one of the terms for a window sash is a guillotine — but it’s still wrong, and just reinforces my interest in how idiom does or doesn’t translate.) Now there is a French roast in the oven, rubbed with butter, Dijon, garlic, and basil. The house smells amazing. It’s been a wonderful weekend. It feels good to be going into a new week this refreshed and positive. This entry was posted in Books, Cogging for Kibble, Diary, Food, Knitting, Spinning, & Weaving, Photographs, The Boy, Weather, Seasons, & Celebrations, Words Words Words on November 14, 2010 by Autumn. 1. We spent Saturday in and around Alexandria/Maxville. We took Lady Jane, the 30″ Schacht-Reeves wheel, back to Bonnie and had a lovely visit with her, Rod, Darroch, and Carolyn. The boy quite enjoyed petting Kitten, their full-grown black and white cat, who responded with head bumps and purrs and entertained him by climbing into boxes. HRH scavenged some shutters from Darroch and Carolyn’s pile of water-damaged building supplies, and Carolyn led us to a place that had had shutters at a yard sale last week just in case they still had them, but they’d sold. We had a visit with Jan afterward, which was lovely, too. t! was absent at a meeting, but we met Whiskey, the lovely orange and white barn cat they’ve adopted, and the boy got to play with Carter, too. Not outside, alas; it was rainy, and we hadn’t packed the boy’s boots or rain slicker. 2. It snowed Saturday night, big fluffy Christmas-like flakes. There were about five centimetres on the ground Sunday morning, which prompted the boy to cry, “Come up and see! It’s January outside!” Most of it melted in the sun we had earlier in the day, but there were still snowy patches on the shady sides of roofs this morning. 3. Sunday morning we had our first family sabbat celebration with the Preston-LeBlancs. This is a direct result of dropping the pagan playgroup that we variously left because of travel time, conflict with choir, too many kids making concentration and discipline hard, and a general sense of losing the focus of the group’s initial mandate. We decided to do our own thing, and I think the first one was very successful. We did a brief talk on what Samhain was about, I led a very simplified version of an ancestral visualization that HRH wrote years ago, Paze read two poems and a storybook, we did a craft, and ended with a song. Without consulting one another overmuch we managed to use very similar themes in our units, and the kids seemed to enjoy it very much. Then we got to sit down and share a lovely lunch. I’d made vegetable cheese soup and biscuits, and Paze brought apple dumplings. It was all really lovely. 4. We headed over to HRH’s parents’ house for Halloween prep. The boy decided the pumpkin should have lightning eyes, a lightning nose, and a lightning mouth, so HRH carved it that way and it looked great. Despite being so thick it really glowed because the light bounced off the surprisingly pale interior. We were using a pumpkin from Jan and t!’s farm, and the flesh was very white. HRH left most of it in instead of scraping a lot of it out, as he would usually do to facilitate carving, so that I can hack it apart and cook it for pie fillings and soup. 5. This year, the boy finally got what Halloween was all about. I painted his face to look like two big dark eyes and paler feathers, but the detail was lost in the dark and he just looked like he had splotches around his eyes. He loved it, though, and enthusiastically trick-or-treated around his grandparents’ neighbourhood, chirping “Trick or treat!” or “Bonne l’halloween!” in his muddled fashion. The last couple of houses he waved at HRH, who had been walking up to the doors with him while I waited at the bottom of the driveways, and said, “You both stay here, I can go alone.” Back home he helped his grandfather hand out candy and got to see all the cool costumes (the undisputed winner was the guy who came as a bedside table, complete with lampshade on his head and a tabletop around his neck decorated with a tablecloth, book, glass of water, and pair of glasses on top). One parent cooed at him and said “Are you a dog?” “No!” he said, “I’m a owl!” and spread his wings, then turned around and did the most hilarious tail waggle at her. He had an odd breakdown at bedtime last night, crying because he didn’t want the weather to get colder. “Well, there’s Christmas,” I said, and he sobbed that he liked Christmas, but not winter. And no, he didn’t like making snow forts and snowballs and snowmen any more, he never wanted to go outside again, he wanted to stay inside where it was warm all winter. I can’t blame him, really. I suspect this came about because he was tired and overtired, really, from a long intense day with lots of excitement. And now I get to have a bowl of that incredibly delicious leftover soup. I’m on my third pot of tea, trying to cut through the yuck in my sore throat, but the cold I woke up with today has left my head blessedly clear, thank goodness. I’ve been handling my to-do list quite capably this morning, and all that’s left is work on the repurposing project and some celloing this afternoon. This entry was posted in Diary, Food, Spirituality, The Boy, Weather, Seasons, & Celebrations, Words Words Words on November 1, 2010 by Autumn. We drove down to spend Thanksgiving weekend with my parents. It was simultaneously the best and the worst drive we’ve had. The worst, because it took us an hour and forty-five minutes to get to Kirkland. The best, because after that it was clear sailing. We left after HRH and the boy got home, which meant we hit the highway at about 4:15. Sure, that’s the beginning of rush hour, but we accounted for that and even so it should have been okay… except there was an accident on every single highway we took: on the bridge into town, on the 20 west, and on the 13 north. The 40 west was just slow. Once in Kirkland we flew at our usual speed, though, and really enjoyed the deep colours of the trees lining the road. The boy got to watch a small light plane take off at the private airstrip, keeping pace with us as it taxied and lifted off. We picked up dinner and ate in the car, trying to catch up on some of the lost time. When night fell we pressed our heads against the passenger windows and watched the stars, tracing patterns in them and talking about constellations. The boy napped on and off, but didn’t actually sleep much. We arrived around 11:30, about an hour and a half after we’d planned thanks to the slow start. But everyone slept hard, and the next morning was bright and sunny and surprisingly warm for the season. 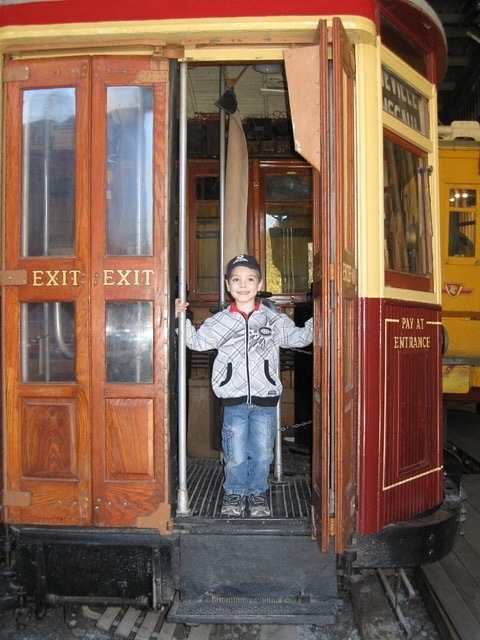 My parents took us up to the Halton Trolley Museum, and we spent hours there, riding all the operational trolleys, having a hot dog picnic, and strolling through two huge sheds of old trolleys and streetcars. It was the perfect day for an outdoor museum like this one. The sky was that perfect autumnal blue, the sun was golden, and the colours on the trees of the forest through which the tracks wound were quintessentially fall. Our last trolley ride was on the 327, an open trolley car from the late 1800s, and the motorman asked if it was our first visit. When told that it was, he told the boy he could ride up front with one adult, and that was such a treat. The sun and the smell of the leaves, the sound of the wheels on the rails and the soft grind of the pantograph on the wire above were wonderful. Trolleys are so relaxing. The older ones had exquisite stained glass accents, pendant lighting, glowing woodwork, and lovingly restored plush or leatherette seating. In the sheds we found an old green trolley that used to run through our own neighbourhood between downtown Montreal and Granby in the 1930s to the 1950s, a trip that would take about two hours. The next day was just as beautiful as the day before. The boys washed the car, and my cousin and his family came over for Thanksgiving dinner, at which my mother excelled as usual: Beef Wellington (for ten! ), roasted heirloom carrots, fennel, and potatoes, French beans, rolls, and for dessert there were butter tarts, pumpkin tarts, and a lemon pie. There’s nothing like seeing a huge roast wrapped in a crust come out of the oven like that. And for hors d’oeuvres before it all there were three cheeses, smoked salmon, and three pâtés, and there was a lovely Henry of Pelham red wine. Seriously, it was divine. And it was great family time, too. Mum had some leaf garland and ghost-making crafts lined up for the kids, bless her, and I love spending time with my cousin and his family. We washed all three kids in the tub together (we’ll have to stop that at some point, but right now they’re still young enough to think it’s a big treat and they look forward to it) and off they went home, and the day was over. The drive home the next morning went really well, too, although it’s always harder going home because everyone’s had an intense couple of days and late nights. It felt wonderful to come home to the house after our first trip away. 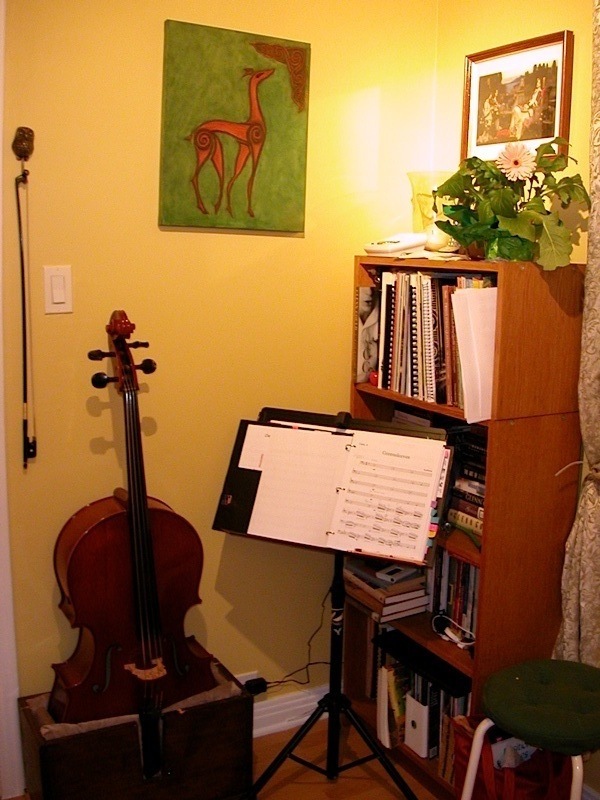 Tuesday was a decent cello lesson, where we started working on my piece for the December recital. It was nice to hear my teacher say that it would be ready with no problem after a bit of a late start on it. I did work on it this past spring on my own thinking I’d play it at the spring recital, but we ended up not doing it because we missed a month of lessons due to various things. It’s Halloween in two weeks and I have to finish designing the boy’s costume. The costuming was hidden behind We Are Going Away For Thanksgiving Weekend and The Wedding The Next Weekend, but once we’re past that it’s clear sailing. His school photos came in too, so we’ll have to sit down and go through the website to choose a background and order them. I’m personally leaning towards a traditional non-photo background, because I find the photo backgrounds really detract from the person in the picture. Fibro-wise I am starting to settle with the meds again. It’s hard to get up in the mornings, a side effect I remember very clearly from last time. I need to adjust the time when I take the pills, otherwise I’m groggy for too much of the morning. Work is going well, too; I got a lot of writing done today on the sample entry for the proposal due next week, and it’s the best work day I’ve had since before we moved. There you are. That’s about it so far. This entry was posted in Cello, Cogging for Kibble, Diary, FM/CFS, Food, Photographs, Sewing, The Boy, Weather, Seasons, & Celebrations, Words Words Words on October 13, 2010 by Autumn.